If you got an Apple MacBook or computer running Mac OS X then you might have noticed that it Plays a mild sound while booting up. If you liked that Boot Sound and wants to get the same on your iOS 7 or iOS 7.1 iPhone, iPad or iPod touch then this guide gonna help you. 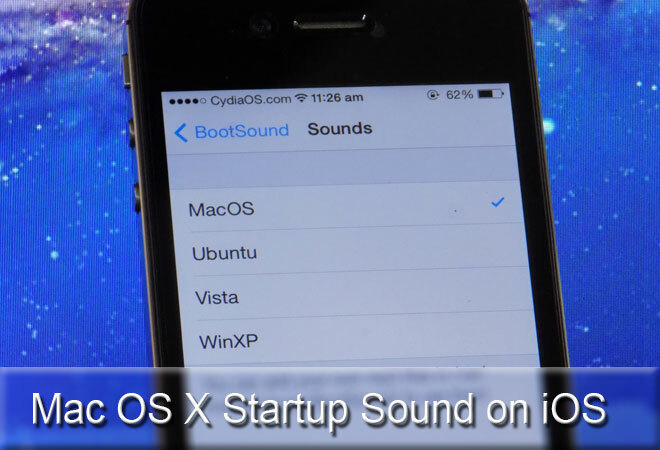 As Here I am going to show you how to add Mac OS X Startup Sound on iOS 7 iPhone, iPad, iPod touch. Not only the Mac OS X Boot Sound, if you’re an Ubuntu or Windows user then also I have something for you. Although Windows 8 doesn’t play any sound at boot, but it’s previous version like Win XP and Windows 7 do play some sound. If you ever liked that sound and wants to try the same while your iPhone boot’s up then continue following this guide. Apart from Ubuntu, Windows and Mac OS X start up sound if you want to add any other sound from your collection then you have to check our other guide on How to Add Custom Boot Sound on iOS 7 and up. There are mainly two ways to add boot sound on iOS 7 – Manual way and with Cydia. In this guide I am going to show you the Cydia Application way, our next guide will be on manual way. 1) First of all make sure your iPhone is Jailbroken and running iOS 7/iOS 7.1 or up and have an working cydia app installer with active net connection. 2) Launch the Cydia App from iPhone Apps drawer. 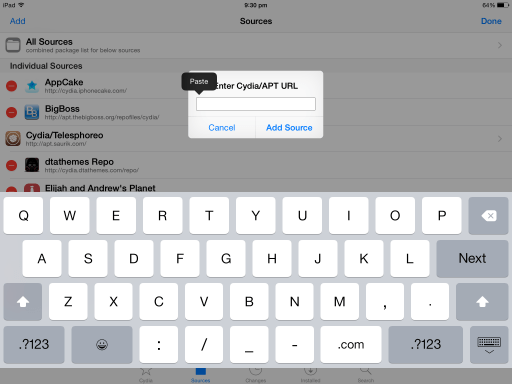 3) Make sure you have ModMyi repo installed by tapping the Sources option from bottom bar of your Cydia. Basically ModMyi repo comes pre loaded with Cydia, but somehow if it is missing from your i-device, then follow this steps to add it back. Launch Cydia > Tap Source option from bottom bar > Tap Edit from top-right corner > now tap add from top-left corner > A popup will appear, there type this repo url http://apt.modmyi.com/ > Now tap Add Sources button and wait until cydia downloads packages from this repo > when done, respring iPhone and continue following this guide. 4) Tap the search option from bottom bar. 5) Tap the search field to pop-out the Keyboard and type BootSound. 6) Now select the result (probably the first result with yellow icon). 7) Select Install option from top-right corner of your cydia, followed by confirm to install the BootSound cydia tweak on your device. 8) When done, cydia will ask you to restart springboard – so do it. That’s it, you have successfully completed the first phase of this guide to Add Startup sound on iOS 7.1 and up. In our next phase you’ll find out how to configure the boot sound on iPhone. Now that you have installed the BootSound tweak from cydia, you have to set the sound you want to play at startup from Setting. Open Setting > Scroll to the end and select Boot Sound > Tap Sound option under Choose Sound > Now Select the sound from the list. If you don’t want to play startup sound in silent mode, then toggle off the option that says “On Silent Mode”. You can also increase or decrease the startup sound volume by sliding the volume bar from left to right and vice-verse. Hope this guide, helped you to implement Startup Sound on iPhone running iOS 7 or up. If you liked this guide please share it. Having any problem? feel free to leave it down in comment section bellow, Thanks. Thanks bud, I use Ubuntu sound on iPhone 5S and it’s superb. Waiting for you guide on Custom Boot Sound. I really didn’t thought that it would be possible to get the famous Mac OS X sound on iOS 7.1 – but then I found your guide.